Ming Chuan University (MCU; Chinese: 銘傳大學) is a private university in Shilin District, Taipei, Taiwan, accredited in the United States of America  and by AACSB. Ming Chuan University was ranked 301+ in QS Top 400 Asia Universities Ranking 2012/2013  and positioned 801+ in 2017 by Times Higher Education ranking. It was founded by Pao Teh-Ming (包德明) and her husband Lee Ying-Chao. The university was named after the progressive Qing Dynasty governor of Taiwan Liu Mingchuan. 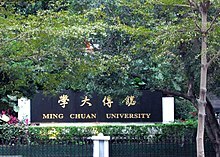 Ming Chuan University was founded in 1957 by Dr. Teh-Ming Pao and Dr. Ying-Chao Lee. It was Taiwan's first women's business school. Dr. Teh-Ming Pao, its first president, had the most significant influence on its development. When the government had just moved to Taiwan and the economy was lagging, with an urgent need to nurture business professionals, Dr. Pao founded the school in the interests of national development, at the same time raising awareness of the talents and rights of women and facilitating their contributions to society. She began preparations in Fall 1956 and on March 25, 1957, the Ministry of Education approved its founding. It began operation the following Fall. The original plan called for Ming Chuan to be located in Danshui. However, a descendant of Liu Ming-Chuan, Madam Liu, was having difficulty maintaining Ming Chuan Orphanage that she had established on Zhong-Shan North Road. She found Dr. Pao willing to take over Ming Chuan Orphanage, which was later converted into the school of the same name. In five years following its establishment the school was twice moved and rebuilt, finally being relocated to its present site in the Shihlin District in 1962. Dr. Pao borrowed funds so that construction could be completed all at once. Since MCU began as a commercial college, the original three-year day school consisted of three programs: Banking and Insurance, Accounting and Statistics, and International Trade and Business Administration. In 1960, Secretarial Science was added and Ming Chuan became part of the national junior college joint entrance examination program. The former four departments were formed into an evening program added in 1963. In 1964, the day school added a Commercial Mathematics department and Secretarial Science was added to the evening program. A five-year program for junior high school graduates was established in the same year and grew to an enrollment of 1400. Ming Chuan strives to produce well-rounded students, matching instruction in theory with experience in application, and stressing both the humanities and technology. The Ministry of Education of the ROC promoted Ming Chuan to senior college status on July 16, 1990. After more than 30 years of development, Ming Chuan’s campus on Mount Fu was full to capacity. In 1967, the school purchased gently sloping ground in Guishan Township (now Guishan District) of Taoyuan County (now Taoyuan City). In 1995, at the invitation of the Kinmen County Education Advancement Investigation Team, Ming Chuan established a campus in Kinmen, thus becoming a comprehensive university with three campuses. Success at Kinmen led the Ministry of Education to approve MCU's establishment of Matsu Executive Master's Programs to promote higher education in Kinmen and Matsu and further Pao's dream “to serve the island residents”, recognizing the right of all to an education. In 2011, the university began holding an annual International Student Paper Competition sponsored by Taiwan ICDF, and finalist papers are published in the Journal of International Cooperation. With the introduction of ICDF (International Corporation and Development Fund) scholarships, the university has become known for its large international population. Ming Chuan opened its Michigan Campus at Saginaw Valley State University in 2014. Excellence: MCU strives to nurture a sense of responsibility and team spirit, as well as excellence in teaching, learning, research, and service. Professionalism: MCU stresses industry-academia collaboration to reinforce theoretical knowledge with practical competence, providing lifelong learning opportunities and a multi-faceted education. Internationalization: MCU has created an international learning environment, expanding the worldview of faculty and students. The university's mascot is a whale named Joy, chosen because of the whale's long lifespan and good social relationships. They are smart, curious, clean, friendly, perform well, and sonar. Whales inhabit the whole world’s oceans, just as those at MCU strive to be broad-minded and global in their perspective. The university flag, like the flag of Taiwan, is red, white, and blue. The emblem follows the color of the flag, with an ascending eagle and three curved figures from the bottom to the top. The globe figure under the eagle represents internationalism and modernization. The design is meant to encourage young scholars to lift themselves as the eagle does with its mighty wings, to have sharp eyes, to soar high, and to not give up though the journey is long. Every year, Ming Chuan University celebrates its birthday/anniversary with a cheerleading competition, after months of preparation by each department. The event is observed by the top staff and special guests. Judges rank the teams and award cash prizes used for the next year's preparations. The university is accessible within walking distance northeast from Jiantan Station of the Taipei Metro. ^ "MCU Motto". MCU. Retrieved October 29, 2014. ^ "2013 International Development Cooperation Student Paper Competition,". Taiwan ICDF. 2014. Retrieved March 10, 2014. ^ a b c "MCU". Wikimedia Commons has media related to Ming Chuan University. This page was last edited on 9 December 2018, at 14:48 (UTC).